Onstage, a crew member makes sure the set is in working order before the show begins. Celebrate “The Circle of Life” with the cast of The Lion King! It’s been 17 years since Simba and his pals first appeared on Great White Way, and to celebrate, we’re taking you behind the scenes at the Minskoff Theatre. Broadway.com photo editor Caitlin McNaney spent the day at the Pridelands, capturing the backstage action before and during the show! 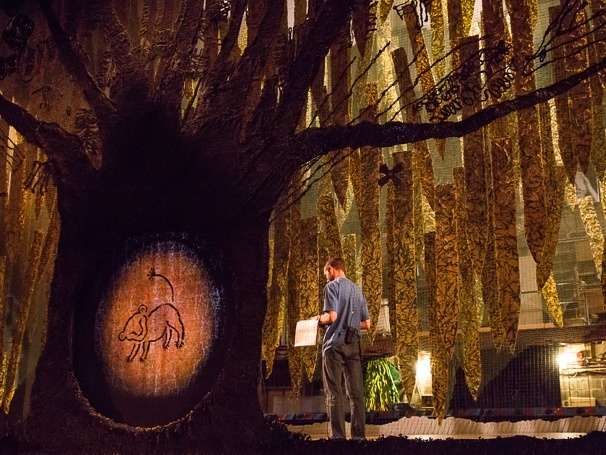 Click for photos, then see the magic of The Lion King come alive on Broadway.